A multi-instrumentalist and vocalist with extensive live and studio experience, Michael plays saxophone, guitar and keyboards to professional standard and has performed with sax ensemble Sax Pack, as well as numerous bands and groups over the years. He currently performs in duos with his wife, Tricia, and as a solo artist under the stage name Michael Anderson. For more information about all the acts, together with details of availability and fees, please contact Michael. Michael's solo act offers audiences live saxophone and guitar - but not at the same time! His set of covers ranges from Roy Orbison to Ricky Martin, with a bit of Gerry Rafferty thrown in, all performed to his own top-quality backing tracks. 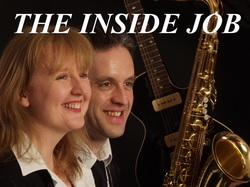 The Inside Job are a versatile vocal/instrumental duo covering a wide range of chart material from the 1950s to the 1990s. 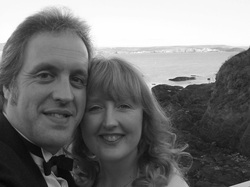 Tricia and Michael Anderson – both experienced solo entertainers in their own right – combine to form a classy duo featuring vocal harmonies and live saxophone and guitar over top-quality original backing tracks. From mellow sounds to lively rock and roll, there’s something for everyone. Lounge Lizards are another incarnation of the Tricia and Michael Anderson performing partnership, this time based around the Great American Songbook. Offering classic standards and gentle mood music with live saxophone and warm vocal harmonies, the Lounge Lizards enhance any special occasion.